This week the Social/Emotional Learning Team, SELT, had a great, professional learning experience by observing alongside the consultants from the National Educators for Restorative Practices Organization. We were able to observe 14 GP classrooms! I want to give a shout out to the volunteers that invited a large group of observers into their classrooms to learn! Thank you to Stephanie Anderson, Morgan Gibbs, Jean Bingaman, Stephanie Weber, Danielle Galow, Kristy Sullivan, Jessica McMurray, Tim Suel, Carrie Knight, Charla Anderson, Micki Lindner, Julie Cooper, Joy Williams and Taylor LeBlanc! The feedback provided below was requested feedback that we wanted to share with all staff members. The feedback is a collective summary of classroom observations and answers to the team's questions that we had along the way. As we think about building positive relationships with our students and a positive learning environment, Restorative Practices, RP, give us effective tools to use. Please read the feedback below and think about your next steps to use the relational tools outlined by the RP observers. Our campus RP goal is to incorporate 2 Minute Connections and Circles. If you want to talk more about using the tools in your own classroom, seek out a SELT member (Bairrington, Ballard, Wilkerson, Eddy, Reed, Joshua Rhine, Simmons, Nail and Smith). The next RP observation visit will be November 12th. Please consider volunteering for the next round of RP observations. Be innovative - Design the possibilities! Our campus support walks on September 24, 2018 focused on the Two Minute Connections and GTKY Circles. Overall we would like to celebrate the hard work, effort, and dedication that your campus has put forth in such a short period of time. In five weeks since the initial training it was very evident that teachers have been working with their student on the use of Restorative Relational tools. We observed 14 classrooms and 100% of the classrooms illustrated a positive environment where the teachers were getting to know their students, the students were getting to know their teacher, and the students were learning about each other. Green Prairie is doing an amazing job on the use and understanding of non-verbal cues during a two-minute connection and a circle, as well as, reviewing the guidelines and acknowledging the talking piece. There was a sense of confusion witnessed between knowing the difference between a two-minute connection and a GTKY circle. A Two-minute Connection: is a fun and easy way to build and sustain positive relationships at anytime in the classroom without actually forming a circle or using a talking piece . Should only take two minutes or less (one or two questions asked). A two-minute connection is a way to Scaffold towards your first Green GTKY Circle. Green Circles are reviewing the guidelines, talking piece and asking questions focused on short easy to answer questions and building a connection/relationship. Yellow Circles are more structure and centered around a theme and takes longer to conduct. Yellow Circles are reviewing the guidelines, talking piece, using an opening connected to the theme, asking theme connected questions, and then using a closing. Teachers are active listeners at all times when using each tool—teachers have to allow themselves to just listen without affirming student responses. As a teacher your excitement or lack of excitement to one student’s answer verses another could influence a students answer or cause a student not to answer. By allowing students to share their answers without limiting their responses (ex: you have to make a choice on a would you rather question. )—it allows the teacher to take mental notes on their students comprehension skills, communication skills, their worldview, and how they apply that view into their answer. It also empowers teachers to use what they are learning about their students during the restorative process within the content to increase student engagement. It was an honor to visit with you guys. We look forward to future collaboration and implementations of the restorative practices in the classroom. If you need any assistance, please don’t hesitate to contact us. Current School Profit: $53,989 (assuming 100% collection)— AMAZING!! Cafeteria: Wanting to balance video watching vs talking while eating and at the same time encouraging great cafeteria behavior, we are going to try an incentive for earning Dojo points as a school. Once we reach that goal, we will have a cartoon lunch. Our cartoon goal incentive will start October 1st. The students will earn cartoons during lunch for the whole school once we collectively reach 1500 points. This month we currently have 1851, so we anticipate this goal would take 3 weeks to earn. Standing Water & Mosquitoes: Please encourage students not to venture out "in the woods" during recess. We do have standing water in recess areas. We have put in a work order request to have the school grounds sprayed for mosquitoes. However, keeping students away from the standing water would be a preventative as well. 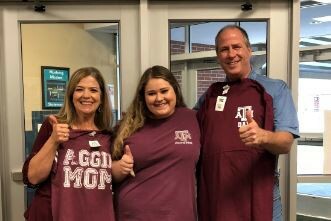 Mikala Slaughter, Donna's daughter, was accepted into A&M! She will transfer from Blinn to start the spring semester at A&M! Whoop! Proud Aggie mom and dad!